East Jakarta Bina Marga Sub-dept. 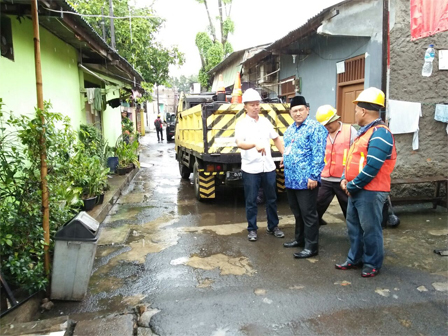 starts to repair Jalan Bakti 1, Jalan Bakti 2, and Jalan Bakti 3 of Pulogebang Urban Village, Cakung on Wednesday (4/25). This environment road repair is targeted to complete in a week.
" We can reach the target if it is sunny"
East Jakarta Bina Marga Sub-dept. Head, Juani Yusuf said, this repair is done due to resident's request. Each roads have 120 meters long with three meters wide. His side uses hot mix asphalt to repair it with average thickness of three centimeters. "Depending on weather. We can reach the target if it is sunny," he mentioned. Meanwhile, East Jakarta Bina Marga Sub-dept. 's Road and Bridge Section Head, Benediktus Situmorang reminds the workers to work professionally. Road's slope must be considered thus rain water can flow well. "Besides, road condition must be dry. Ditches also need to be considered. Including road's slope level thus water can flow well to connecting channel," he informed.